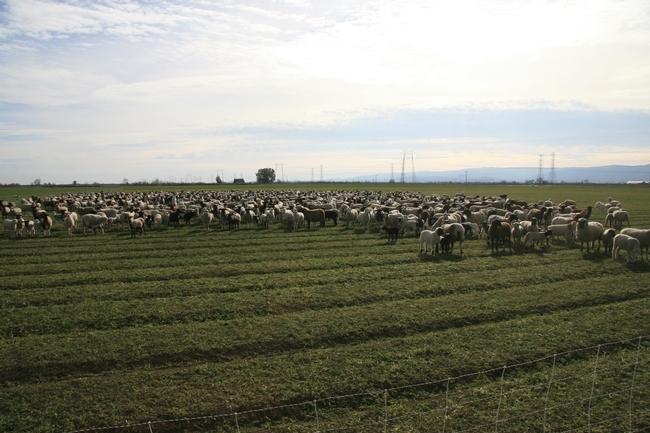 Winter is typically lambing season on Northern California sheep ranches - a perilous time of year. Baby lambs are vulnerable prey for wildlife like coyotes, mountain lions and bears. With increasing numbers of wildlife, both rural and urban neighborhoods are being impacted. At the UC Hopland Research and Extension Center, we are braced for our first winter under a new policy that minimizes the use of lethal control against native wildlife that prey on our lambs and ewes. As director of the 5,300-acre Mendocino County research facility, I'm nervous for the well-being of our 500 sheep and lambs soon to be born. The animals are defenseless, therefore it is our responsibility to protect them from predation by wildlife or other animals, such as domestic dogs. Many non-lethal methods of protecting the sheep have been implemented over the past several months. 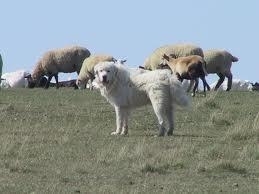 We installed and repaired fences and brought in five new guard dogs to protect the sheep. Our new practices seemed to work last spring and summer. We can't draw research conclusions from one year of data, but the number of sheep confirmed killed by wild carnivores in 2015 was much smaller than the year before, 10 vs. 48. 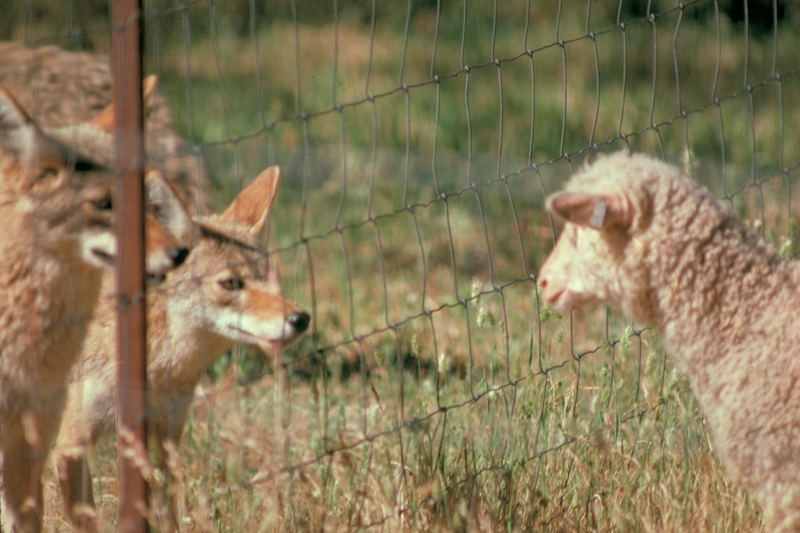 And the number of coyotes taken so far in 2014 – 15 – was about half the amount in 2014. I'm encouraged by the numbers. But we want to do better. 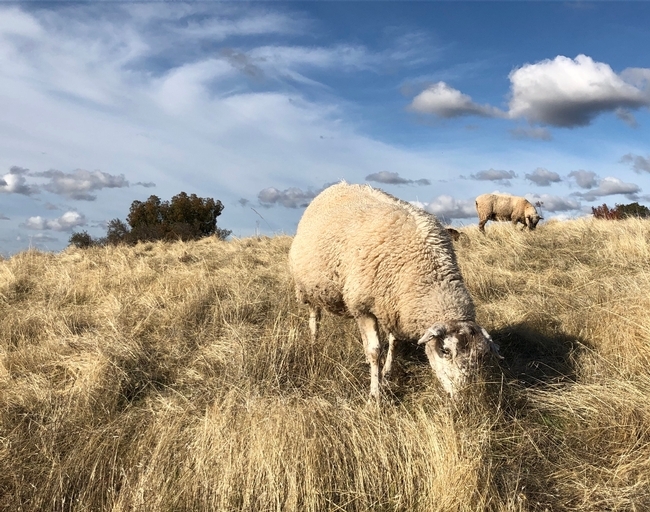 As a University of California research center, Hopland is the ideal place to study ways for sheep ranchers throughout Northern California to maintain sustainable flocks even in the presence of the growing, and increasingly diverse, wildlife population. At Hopland, we are interested in learning more about how to prevent conflicts with wild animals and reduce the need for lethal control of wildlife. This information will inform policies for wildlife control in cities, rural areas and on ranches. 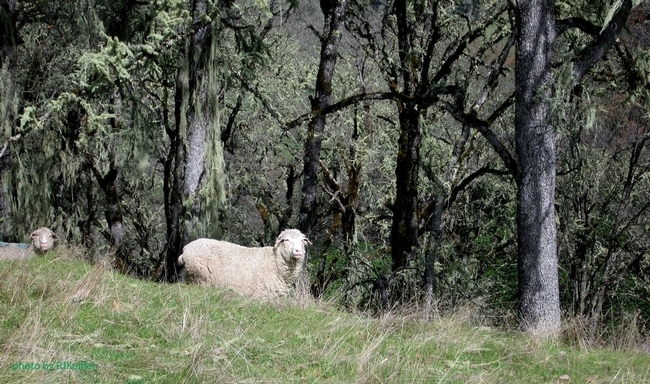 The Hopland REC was a working sheep ranch when it was purchased by the UC Division of Agriculture and Natural Resources for rangeland and animal management research in 1951. From the 1990s to the 2000s, 10 to 15 percent of lambs or more were killed each year by predators – mainly coyotes – despite aggressive non-lethal and legal lethal control, according to Bob Timm, a UC Cooperative Extension specialist who served as director of the station for 30 years before retiring in 2014. We will always have predators threatening our sheep. 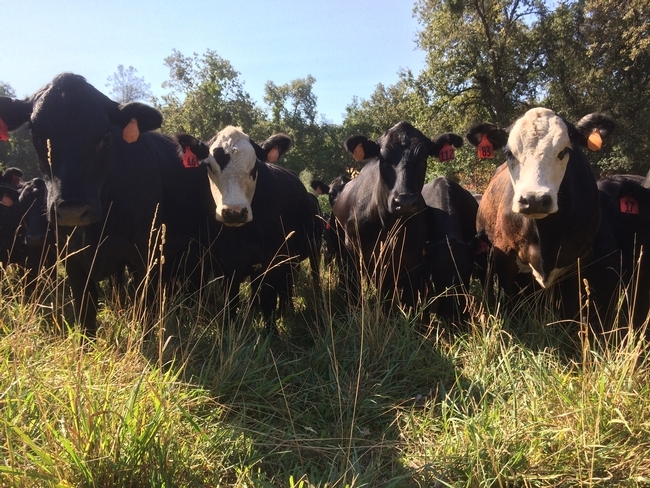 We need research-based information to inform us how to deal with them humanely while maintaining economically viable ranching operations in Mendocino County and throughout California. Justin Brashares, a professor of wildlife ecology at UC Berkeley, has developed a research plan for the center. 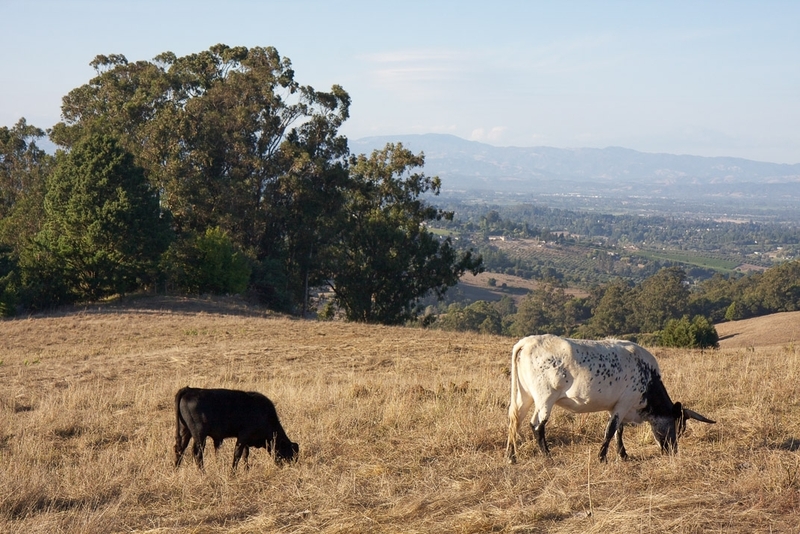 We are seeking funding and, in the coming years, will use Hopland as a living laboratory to answer many questions scientists and ranchers have about wildlife in Northern California. The research will help us estimate the wildlife population. We plan to use high-technology GPS collars on prey and predator species to develop very fine-scale information about their interactions. Hopland will also be a site to study the very fencing we and other sheep producers are earnestly installing to protect our sheep from hungry carnivores. I believe we are lucky to have the wildlife among us. I'm committed to helping our community protect wildlife and raise sheep with research and education programs at Hopland. Stephany Wilkes shears a 150-lb Targhee-Columbia ewe at Hopland Research and Extension Center. It's May in Hopland, and the sparse winter rains are nothing more than a memory. Sharpened shears at the ready, Stephany Wilkes, an information science Ph.D. who works for Mozilla, walks a 150-pound sheep into the shearing area. 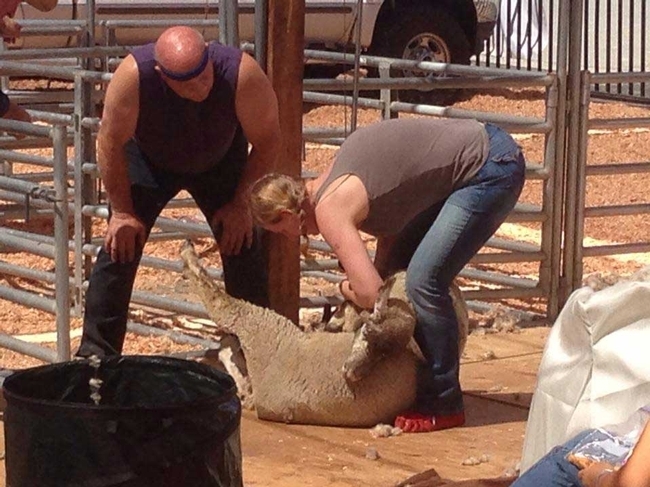 Under the watchful eye of expert instructors, she flips the sheep on its side and starts methodically removing the fleece, smoothing the skin with her left hand, clippers in her right, moving the sheep with her legs. Since there are 400 ewes whose fleeces must be shorn before the hot summer months, that's important for her and her classmates. 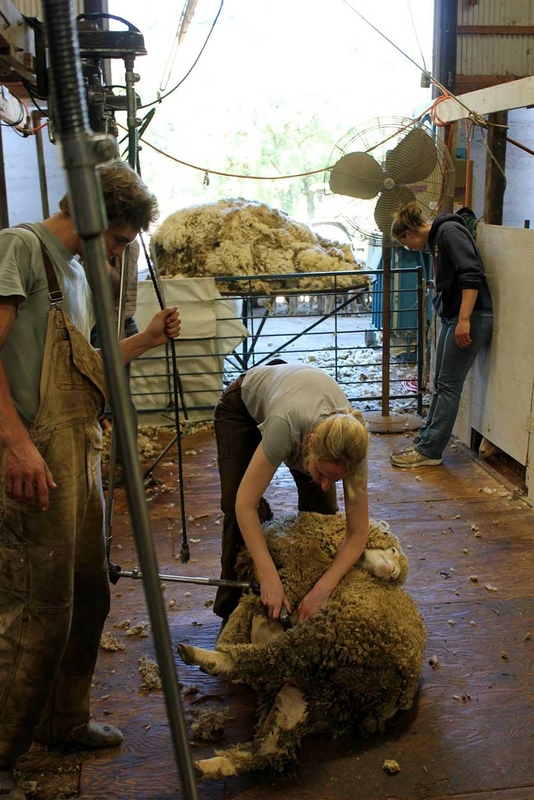 The University of California Cooperative Extension Sheep Shearing School is the only program of its kind in California. It has been run in Mendocino County since at least 1990, but in 2009, it moved to the Hopland Research and Extension Center south of Ukiah. 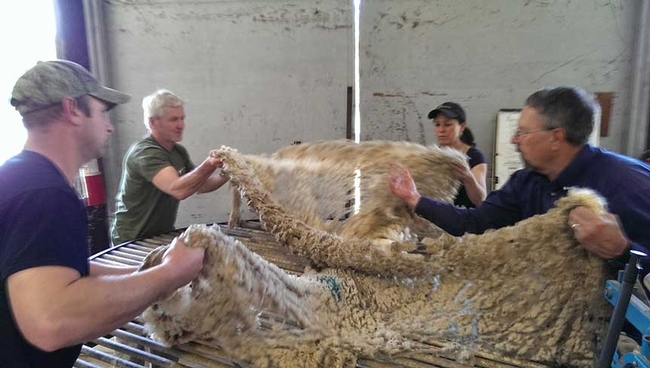 Students are taught the New Zealand method of shearing, where the entire fleece is cut from the sheep as a single unit so it can be sorted and graded according to micron count. The method is designed to be comfortable for both shearer and sheep. 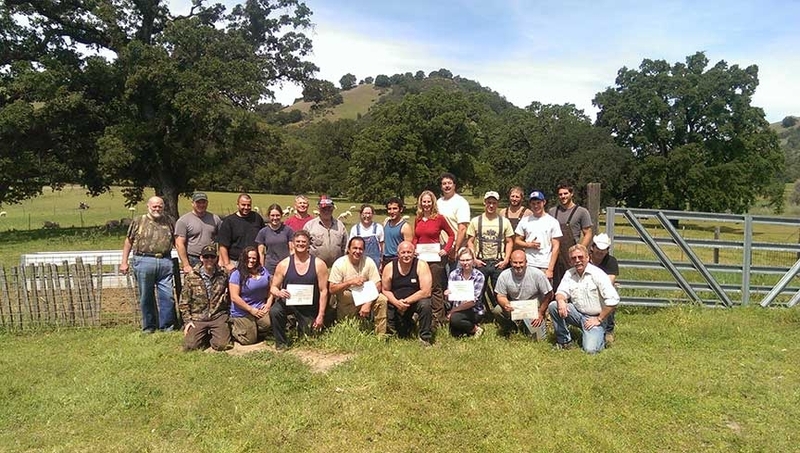 John Harper, UCCE natural resources advisor for Mendocino County, has been running this program for more than 20 years. Although these sheep weigh enough to make handling them a workout, he says that hip flexibility is more important than upper body strength. Since this is something women tend to have more of than men, they are often successful students. More than 250 students from across the western U.S. as well as Canada and Mexico and have graduated from the program. Many come back year after year to practice under supervision, but also to connect with each other. 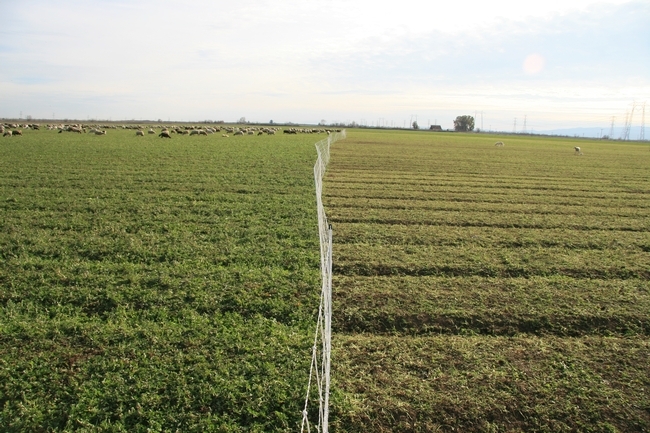 This year, a wool grading section was added to the course, taught by Ron Cole and Rodney Kott. Sheep have recently been bred much more for meat than wool in the region but there is a growing demand for high quality fleeces. The finest merino sheep do not do well in damp North Coast conditions but thrive in the dryer Central Valley and foothills, and there is a need for trained graders. Only 3 percent of California's 5 million pounds of wool is currently being processed within the state, and yet California remains a net importer of wool goods, while falling second only to Texas in sheep production. California fleeces are either composted or sent to China for processing, something another graduate of Shearing Class, Matt Gilbert, is keen to avoid. 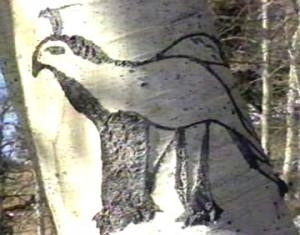 Gilbert was inspired by the Fibershed movement started by Rebecca Burgess in 2010. Drawing on the locavore movement, Burgess committed to clothing herself for an entire year with textiles grown and produced within 200 miles of her house in Fairfax. The movement is gaining adherents across the country and beyond. Wilkes says the Fibershed movement is what got her interested in learning to shear, too. “Eight years ago, I walked into a yarn store in San Francisco and asked where the local yarn was. I knew California was a major producer of wool. I was told there wasn't any. I was curious about why, and became involved with Fibershed and attended their first symposium in October 2012. During a panel involving shearers [one of whom was Matt Gilbert], I found out that small flock owners had a hard time finding people to shear their sheep. That got me thinking that I could learn to do the work," Wilkes said. Harper explains that the North Coast sheep herding trends have changed over time – from large producers to smaller flocks – but now there is a move back to some larger flocks, driven in part by the Vines and Ovines project established in Mendocino County by UCCE advisor Morgan Doran with help from UCCE advisor Roger Ingram of Placer and Nevada counties, UCCE advisor Stephanie Larson of Sonoma County and UCCE specialist emeritus Mel George. The sheep were subjected to aversion training so they would not eat grape leaves. Now they browse through vineyards, conducting weed control and fertilization without harming the vines. One vintner, Clay Shannon, has 1,500 ewes. He pairs premium lamb with his wines in sales to niche markets. The idea is catching on. Meanwhile, Wilkes is shearing sheep across Northern California on weekends or before work. The 2014 Shearing School class. Stephany Wilkes at the Sonoma County Fair.